There are a variety of ways both natural and chemical for getting rid of ant hills. This is a guide about getting rid of ant hills. I suggest the following procedure for eliminating ant mounds in lawns. 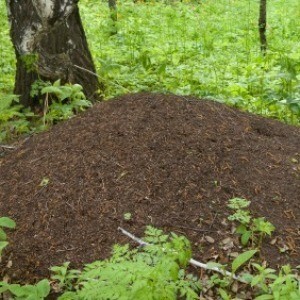 First, rake the ant mound down level by spreading the dirt to the surrounding area. Wait several days to see if the ants rebuild the mound. If they do, you can chose to use an insecticide to reduce the population rather than fight the mound with repeated raking. After the mound has been raked level, sprinkle a small amount of diazinon granules or Sevin dust onto the area. Rake again to mix the insecticide into the dirt and then water the area. Hopefully one treatment will reduce the ant population sufficiently to make their presence tolerable for the remainder of the summer. If not, repeat as needed. Any ideas on how to get rid of ant hills in the lawn? This year my Mom and I both have really bumpy lawns, and we both seem to have been overrun with ants. I would like to be as natural as possible. I have tried hot water but they just seemed to come back. Try hot soapy water. Dish wash soap works. Pour aspertame down the ant hills. Ant's hate the stuff and it should get rid of them. Put your used coffee grounds on the ant hills and they will leave. Have i the answer for you. All those empty plastic bottle tops will come in handy with this recipe. In a bowl mix equal parts of baking soda and icing sugar. Fill the tops with the mixture, and place in the garden so it's flush with the soil. The mixture will do the trick. You see the ants will eat the mixture then die from being bloted from the baking soda. The mixture must stay dry so if it rains you will have to start over. I have had real good luck with corn meal. Just sprinkle it around the mound and they eat it. Then they get liquid which swells the cornmeal and they die. Good Luck. I use cleanser, like Comet or Ajax. Sprinkle it around the hole. I tried everything: bleach, ammonia full strength. They disappeared and came back again. However, I tried full strength white vinegar. The haven't returned. It has been years now. Give grits a try. Wait for a day that it won't rain. Sprinkle dry grits around the ant hill. The worker ants will come out, and take this to their queen as food. She will consume the grits, they will swell, and she will die. No queen, no workers. How should I tackle removing the nest? It is approx. 18inches in diameter and approx. 15 inches high. How can I get rid of ant hills naturally? I have fire ants in my compost bin, & I need something to kill them & not harm my compost. Hi there, and so sorry to hear of your ant hill problem!! I used to get the BIGGEST ant hills. They were GIANT. The BEST thing I found was to pour a pot of BOILING water on the largest hill first, and then move down the line... I had 4 pots going at once. lol.. Make sure to let the water saturate the soil, as ant hills can kind of 'shed' some of the water. Do this THOROUGHLY one morning and then again that night, and you will be RID of all those nasty hills. What could be more simple than BOILING WATER?? LOVED IT. It is now something I do each year, and kind of look forward to it, as funny as that may seem. It just works so well!! I use cheap powdered laundry detergent and sprinkled it on the cracks when they surface after it rains. This seems to work really well. I have hundred of ant hills all over my property and they are killing the pine trees nearby, it would be difficult to use boiling water on so many. Any other ideas for a large quantity? DO NOT BOIL VINEGAR if you want to be able to breath in your house. Boiling vinegar steam is a hundred times more offensive to the eyes and lungs than a whiff of cold vinegar. Voice of experience. Please heed the warning! Is there an easy, cheap way to do away with the mounds of ants popping up? I've heard of several household products that are suppose to work and don't. Squeeze bottle with Karo syrup 90% add about 10% 20 Mule team Borax (not boraxo or hand wash). Warm and shake until dissolved. Place squirt where ants go but not where pets or wildlife might eat it. The workers carry it back to nest and the queen is killed. Queens can live 20 years and produce many more queens. How to get rid of ants and ant hills on a paver walkway? Once you figure out how to get your ant problem under control, consider ways to prevent problems from reoccurring in the future. There are several good brands of sealers and joint sand stabilizers on the market. These are designed specifically to keep weeds and ants from taking up residence in between the cracks of landscaping pavers. Although I have not thoroughly researched individual brands, several claim to be environmentally friendly and seem like a good, long-lasting alternative to using chemicals. My friends who are landscapers tell me that using them when installing pavers has become standard industry practice among many professionals. The stabilizers form an almost impenetrable barrier between the paver cracks by adhering the sand grains to each other and locking them into the joints. This prevents sand loss due to settling, while keeping out weeds and ants. sprinkle with oatmeal. The ants eat it and swell up and die. I use the sugar-borax mixture dissolved in a little water and soak cotton balls. Put these on the anthills, or in a jar with holes poked in the lid and placed on the side so ants can get in. It takes a while, but they take the food back with them and the colonies are killed off. I had three of these in my yard for the better part of the summer. After one colony was killed off, I moved a jar to the next place I saw ants. Slowly, my yard became mine again. Try pouring boiling water on the hill. Since the hill is located on/near a paved surface, the hot water won't make dead spots on your lawn, but it will kill the ants. I find that each type of ant is attracted to something different...sugar or proteins. The tiny black ones in Texas are "sugar" ants, as are the lightest red ones. similar to Carpenter ants in appearance but more "playful" and lively. Carpenter ants are after termites which are full of cellulose, I understand, often eating into the termite trails of wood as well. Pharoah ants are fairly harmless eating dead bugs mostly, cleaning up the garden. The sugar ants are harmless as well, I hear. easy to recognize because they are fighters and are darkest red in color, stinging to protect and defend their territory,often bullies to smaller ants. All ants don't need eradication, you know, because many perform a good function. as to working a lot, teamwork, harvesting, and storing for times when we may not be able to do so. He obviously created the ant with purpose in mind, don't you agree?He certainly speaks of the ant often. Good luck and God bless you and yours. We have ant hills on our brick patio deck. A friend suggested pouring boiling hot water over them so the ants surface to the top. Do you know any other easy remedies? Anything that doesn't involve poison. How can I get rid of ant hills in my garden? 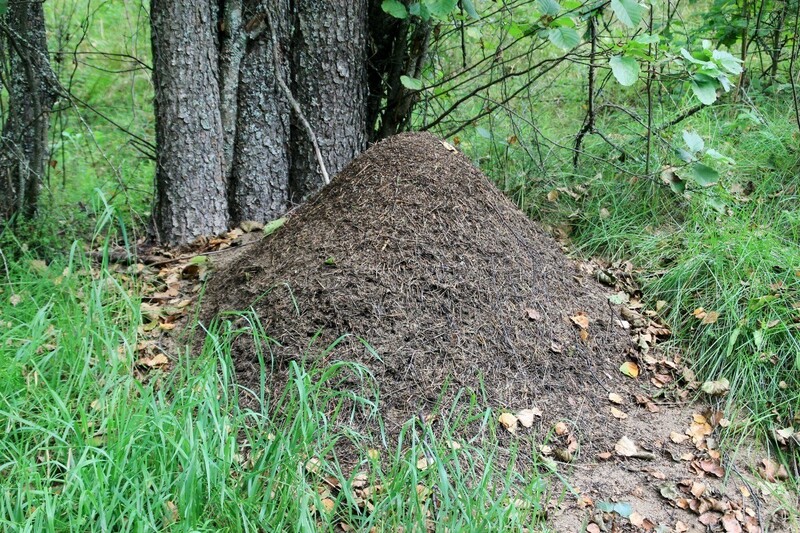 We have an ant hill about 3 feet high on our property. It is getting bigger. What do you recommend? Thanks. I have a couple of ant hills in my backyard and I was wondering if anyone had a natural way to get rid of them? Q: We are starting to have an ant problem again this year. I am looking for something that will get rid for them, maybe something that can be made from items in the kitchen. There seems to be thousands of tiny ones in each hill. We do have animals and don't want anything that will be harmful to them. Most ants are important to the garden. They help aerate the soil, scatter seeds and prey on harmful insects. When they become a nuisance, the best approach to controlling ants is to figure out what types of ants you have and what factors are contributing to the problem. Ants will naturally set up colonies where access to food and water is readily available. For example, certain types of ants herd and prey on sap-sucking insects like aphids. If you get rid of the aphids, you will soon have fewer ants. If ants are getting into your house, take note of how they are getting in and where they are headed. Remove any crumbs or other sources of food and water that they seem to be taking advantage of (inside and outside). Seal off cracks in doors or windows with a bit of Elmer's© glue or clear silicon sealant to prevent them from entering. Add a little boric acid to the glue or sealant to keep them from eating the glue. For immediate relief indoors, try combining 8 oz. of lavender-scented ivory dish soap with 1 oz. of an essential oil like Cinnamon, Citronella, Rose or Tea Tree oil. Add 5 tablespoons of this to a quart of water and apply it using a spray bottle. This isn't a solution for long-term control but it will help temporarily. You can also spray this on garbage containers outdoors. If ants are after your fruit trees, try placing duct tape (sticky-side out) around the trunk to keep them from climbing up the trunk. I have tried the used coffee grounds on the ant hill and it did work... but it took awhile! I work in a bank and we saved the grounds from all the coffee we made here. Every few days, I would put the grounds on the ant hill. One day I notice that the little ants were using my used ground to build their hill even higher! I kept doing it and even bought a pound of cheap coffee for $1.29 and made a loose paste out of it and put it all on the hill. Eventually after a 3-4 months, the ants and the hill were gone. In fact the hill collapsed and now I have a dent in my yard where the ant hill was!